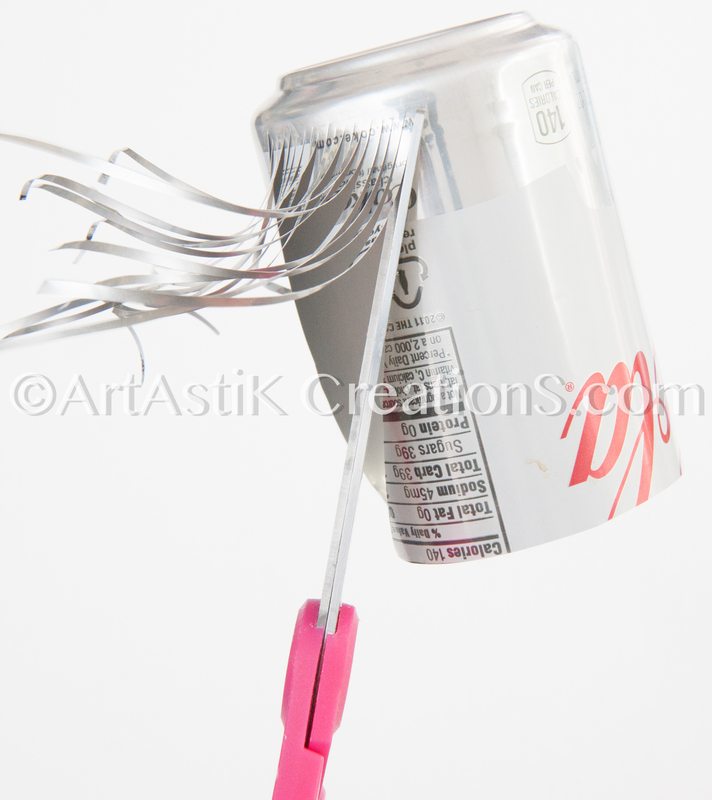 Drinking soda is good for Art :) A green tutorial! This project is a part of my Inspiration Series. I’ve been thinking of some projects that can be green and can come from recycling everyday products. For as far as my memory goes, in my mother’s boutique, from the leftover tailoring stash, my mother used to give me some scraps of fabric, beads or left over ribbon ends and we used to make something creative out of it. My mother and I love to recycle from the smallest part- not much goes to the trash. Now, I am amazed to find when people cut out fabric or paper from templates and so much goes to waste. I think planning how to fit these cutouts in the smallest piece will save quite a lot! Its exactly like packaging works: smallest sized box comes out full of treasures! On the other hand there are several people who recycle and make wonderful things out of recycled stuff. 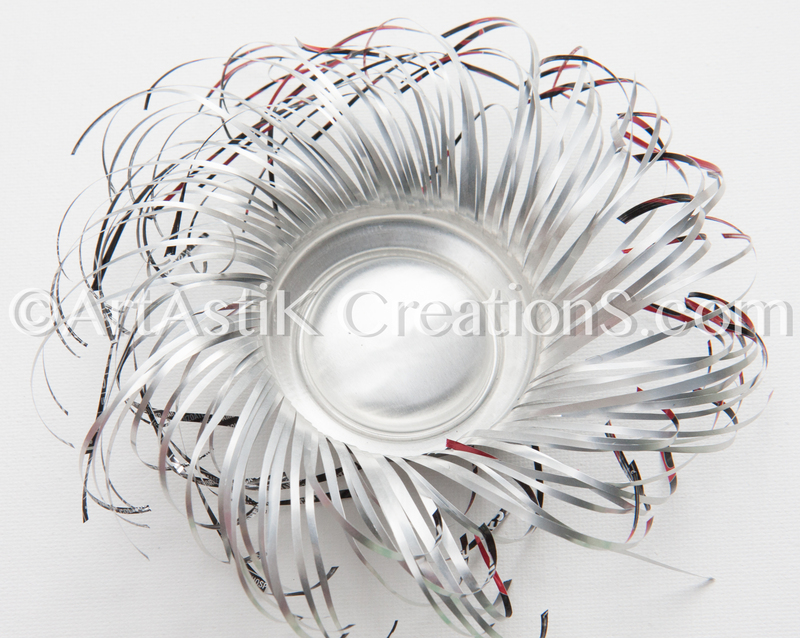 For e.g: Michele Made Me creates wonderful items from all sorts of recycled materials. I also came across a fantastic artist called Michelle Brand. Check out her creations here. These are fantastic!!!! I am absolutely thrilled to be inspired by both Micheles! I decided to make my own art. 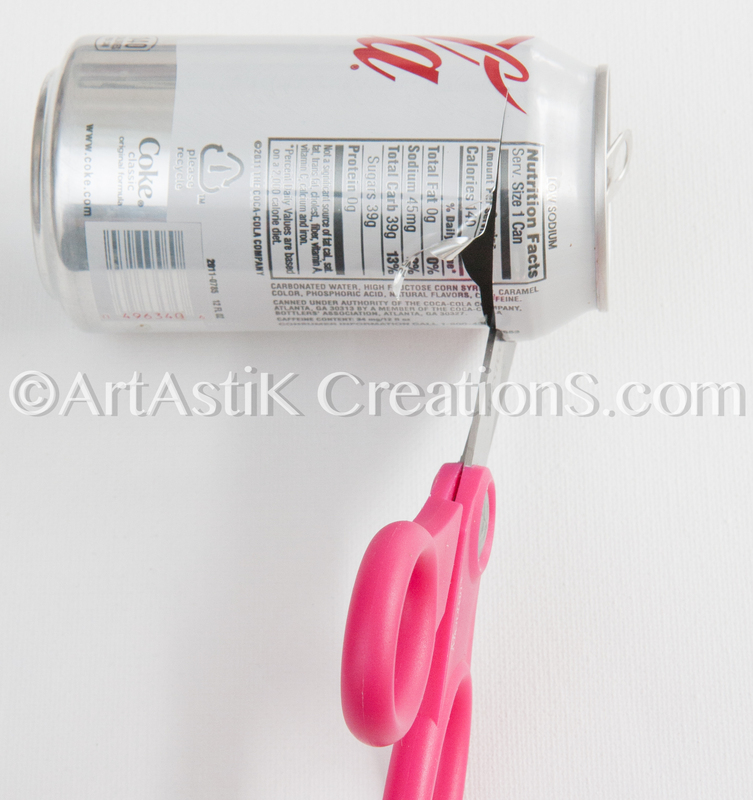 In any case, after trying this idea, I have been going crazy about the places where I could use my scissors. Watch out! 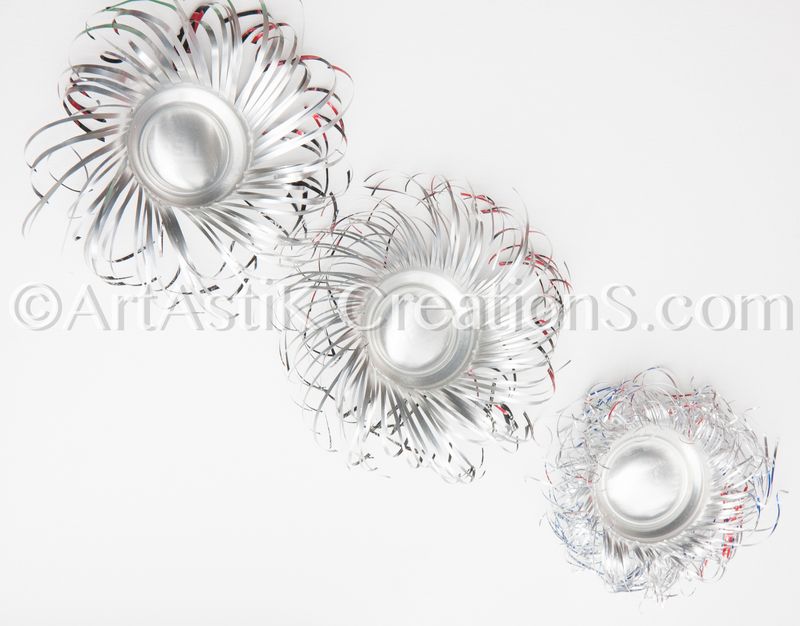 I loved making patio lanterns, flower bouquets, Pinwheels, SunBursts etc out of these cans. I hope to post the pictures soon! Here is the tutorial that I promised. This project is not for young children. I have got many scrapes and cuts from the cans. Wear heavy duty gloves to protect your hands. 1. 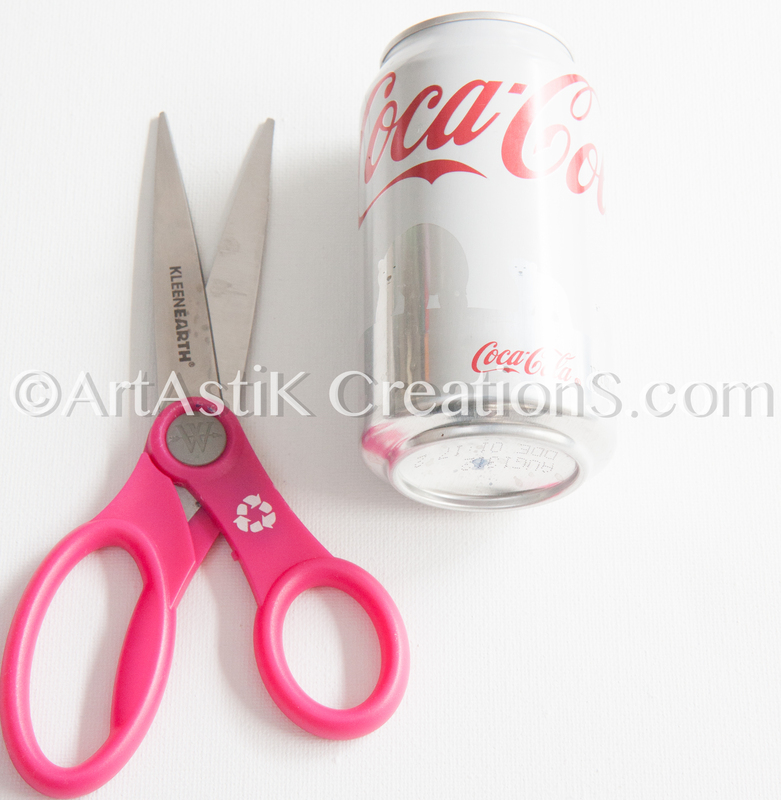 Get an empty soda can and scissors. 2. 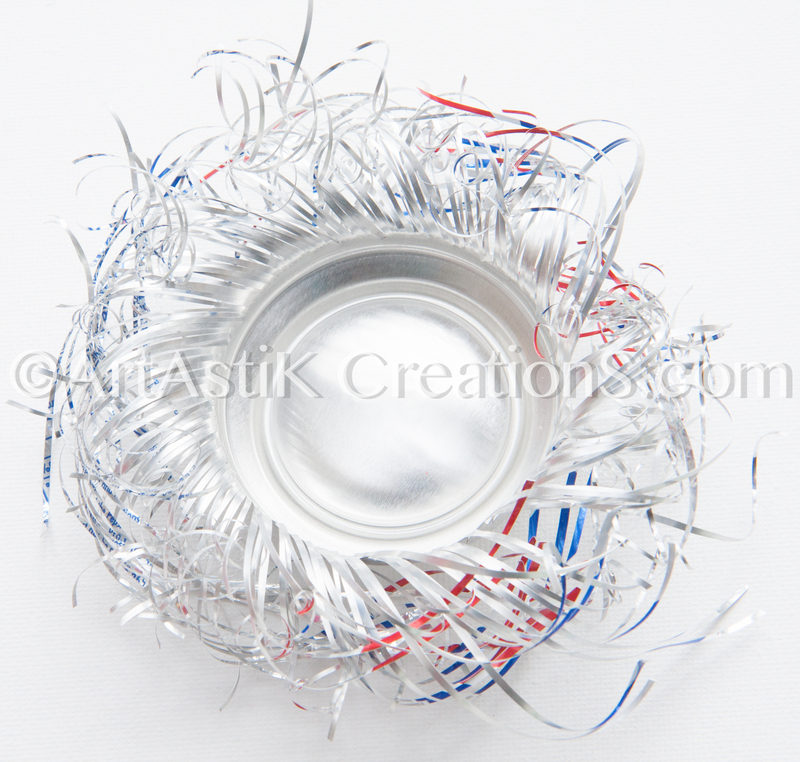 Wash the can thoroughly – leftover drops are quite sticky! 3. Cut off the rim to get the top off- about 1/2 -1″ an inch. 4. Cut again to get a smooth line. 5. Start cutting the can at an angle from top to bottom. I stopped cutting at the edge of the bottom rim. I liked it as I thought it will show the center of a flower. 6. Cut parallel lines. Cut as thin as possible. 8. The thinner the cut, the twirly the petal is going to be. 9. I used these flowers in several art pieces – Pinwheels, Reaching for Flowers, Sunbursts, etc. Hope you give it a try and post some pictures! Beautiful! I did a very similar flower (though I didn’t manage to make my cuts as fine as yours-wow!) 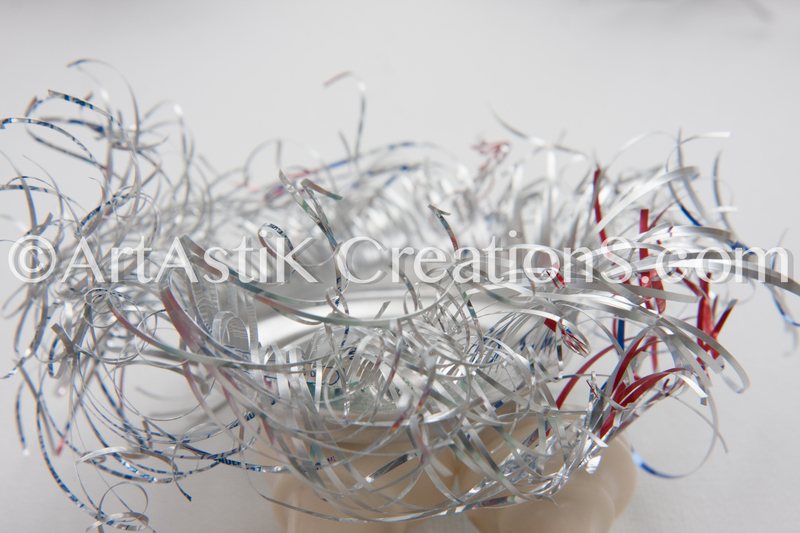 and I was amazed at the way the metal curled into ringlets just like ribbon. So much fun! Thank you for your kind appreciation! It is fun to experiment, isnt it! Very cool! Do you use a special kind of scissors? Not really. I used my regular craft scissors. I used some heavy duty scissors during the early experimentation. However, the end result was clumsy. I like fine lines and the regular scissors worked just fine. Try it out and do post some pictures! Nice job!! Please suggest some uses for the product. Candle holders, centerpieces, wall art etc come to my mind. Would be nice to actually put this to some use, “recycle” in the true sense. I see the last line how you used it now….pics please!! These seem to be great suggestions Rujuta! I have thought about centerpieces and wall art, but did not think about candle holders! See it helps to share your thinking! I am in the making of a larger piece with this. Once I am done, I will post it for sure!